Flexible collections and no fixed term contracts! Our offsite document shredding and confidential paper shredding services are designed to fit around your business. Collections are arranged to suit; weekly, twice weekly, whatever. And – uniquely – CAS will NOT tie you to a fixed term contract! Increasingly confidential information is stored on CDs, DVDs and hard drives. We know that these can cause a lot of damage to the reputation of an organisation if they fall into the wrong hands. Let us know what your needs are and we can supply you with bins or bags to sort your waste, prior to shredding. 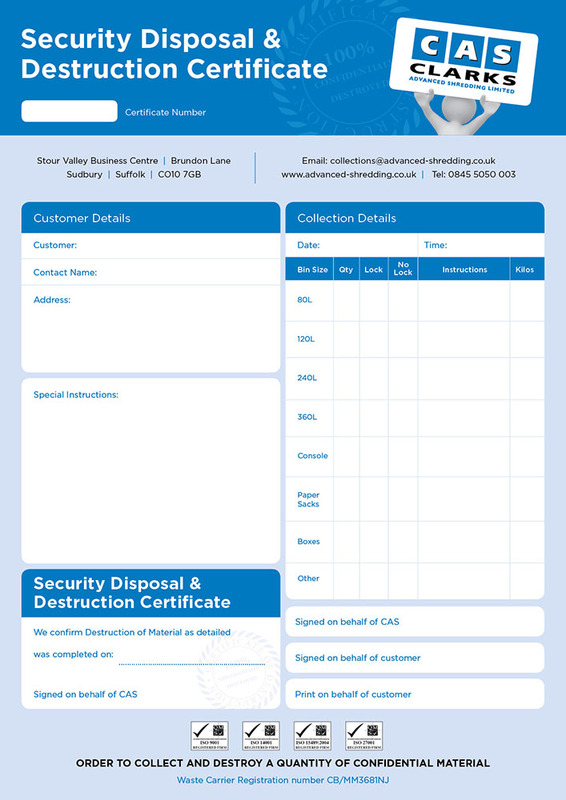 All CAS staff are security vetted and you can be confident that your material will not be handled by any unauthorised personnel.